This is a task on the concept of Linear Functions and Multiple Representations. This is a 4 page team task. 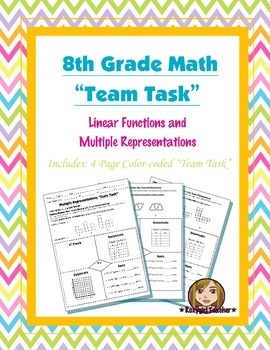 In this task students will take turns as "Team Mathematician". Students will review academic vocabulary. 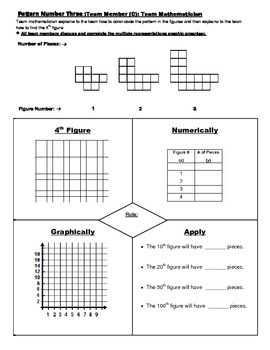 Students will use multiple representations to complete the task: tables, graphs and equations. The task is color-coded and requires students to support their answers. Students will explain and justify their reasoning in complete sentences. 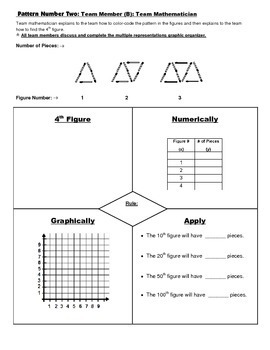 * This task will have your classroom rich in mathematical discourse. *** My "Team Tasks" are created to be completed in Teams of four. Each student is a team member: Team Member (A), Team Member (B), Team Member (C), and Team Member (D). 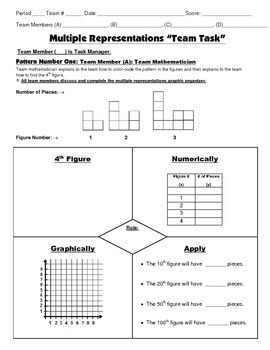 Each team member is required to participate regularly throughout the "Team Task" as Team Mathematician. My cooperative learning "Team Tasks" require the students to be actively involved throughout the entire "Team Task". The Role of "Team Mathematician" alternates throughout the "Team Task". My "Team Tasks" are designed to elicit mathematical discourse within the teams.